This PySide tutorial shows you how to create a "classic" form-based UI with the Colibri QML Components and have it filled and controlled by Python code. There are several ways to do this, and depending on your use case, there might be a better method. Please also note that in this example, the controller code knows a bit about the UI (or rather: the UI has to inform the controller which widgets are to be filled), which might not be desired. All these slots take a QObject as parameter, and from the QML file, we will pass the root object there, which has a property widgets where we save a dictionary of mappings from name to QML component. The fill function takes care of filling in the data of the current car into the QML widgets. We first need to create the controller, which then also knows about our cars. Then, there is some housekeeping that we need to do - create a QApplication, create the QDeclarativeView and set its resizing mode (so that the root object in QML is always as big as the window). We then get the root context and expose the controller and the cars list to it (if you look closely, we don't really need the cars themselves). 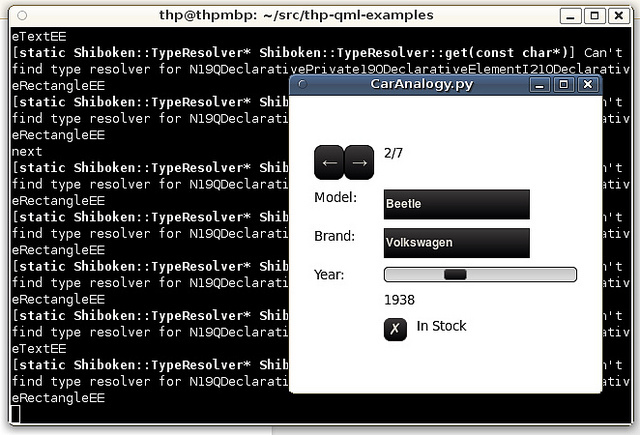 Then, we load the QML file, show the view and start the application. This is the user interface of our application. We only use the controller in the UI, and we also only use it for initialization and when buttons are clicked. This page was last modified on 5 June 2016, at 03:29.